Scientists have discovered that giant clusters of galaxies are being pulled in a uniform direction apparently by gravitational forces that can't be explained by known phenomena in the observable universe. 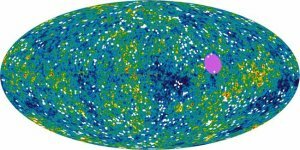 Researchers have concluded that based on recent studies, these forces are ostensibly from outside the observable universe, not within it. Remember, the observable universe is only that part we can see. We see out to only the part within a sphere that extends to the distance coinciding with the estimated age of the universe — or approximately 13.7 billion light years. Based on the fact that the universe is expanding at an ever-faster rate, it's highly probable that there are regions beyond our ability to see. In other words, regions of space more than 13.7 billion light years distant. So distant that the earliest light that left these regions has not yet reached our corner of the universe. 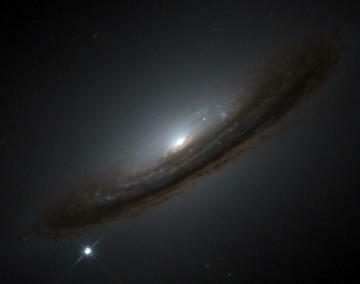 Cosmologists are calling the phenomena Dark Flow. This is separate and distinct from the forces causing the acceleration of expansion in the universe, which is known as dark energy. This dark flow is causing large-scale galaxy clusters to move rapidly toward a reqion of space in between Centaurus and Vela. The speed is estimated to be on the order of 2 million mph (3.2 million kph,) and doesn't decrease with distance as far as researchers can measure. See the original article on space.com for more information. What Lurks Behind the Light? When the familiar becomes the unfamiliar, it can either be a little unnerving, or, it can make us marvel as if we're seeing things for the very first time. That's how I felt when the image of the Sombrero Galaxy (M-104) began coming up on my screen from the March 8th Astronomy Picture of the Day. In 1999, an APOD image from September 16th, is a neat little shot that combines TWO images taken 3 years apart that clearly show the nebula e x p a n d i n g !! The images shift between 1994 and 1997, and if you watch closely, you can actually SEE the nebula expanding and contracting. But in this newest image, notice the greater detail in the "knots" of material around the thicker portions of the nebula, as well as in the whispy streaks, too. 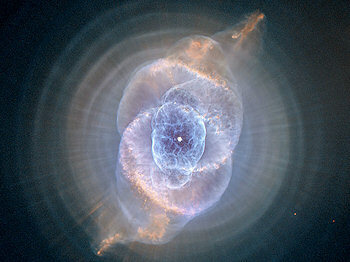 It would be cool to once again create a two or even three image "blinking" effect to see more continued expansion of the material in the Cat's Eye. Undoubtedly, this new way of getting more information from already established and well-known astronomical objects by using High Dynamic Range Wavelet Transform algorithms (HDRWT) will soon become a preferred way of processing images, possibly for some of today's up-and-coming crop of new astronomers. What I wouldn't give to be one of them! Perhaps just as importantly, though, what new technologies will be developed and presented on the APOD website next? I was just looking at a great pictorial article (8pp), Night Vision - NASA's Spitzer Space Telescope Lights Up The Heart of a Dark Universe, in the Dec. 2005 issue of National Geographic magazine. Launched in August 2003, this car-size telescope is 26 million miles from Earth. Spitzer utilizes 3 different instruments to capture and analyze different infrared frequencies. The telescope's infrared vision is the sharpest ever, using a mirror nearly 3 feet across, sensitive detectors cooled almost to absolute zero, along with an orbit far from the distracting heat of our planet, Earth. Spitzer is expected to run out of the liquid helium that helps cool it, in about 2008. The color pictures in the article, compiled from Spitzer, are well worth the time to look at and to read this brief article. In 1994, while working through the 400 objects required to earn my Herschel 400 Certificate, I made an observation that didn't excite me until nearly five years later. Here's how it happened. Supernova 1994D as imaged by the Hubble Space Telescope in mid-1994. In the hobby of amateur astronomy, I consider myself an observer first and foremost. It’s the one thing regarding astronomy that I’ve spent more time and effort on of all the various aspects of this hobby that I’ve tried. I have two observing certificates from programs offered through the Astronomical League, and these are my Honorary Messier Club Certificate (#678; June 1987) and my Herschel Club Certificate (#134; Sept. 1995). These certificates are awarded after successfully finding 110 objects and 400 objects respectively. I cherish them both. I began my Messier observations before I even had my own telescope. At about the same time that I first met the other founding members of AOAS, someone told me about this certificate that I could earn for viewing certain specific objects. That sounded almost too easy. All I was required to do was to simply write down some specific information for each of these objects as I found them, things like the date, time, how big the telescope was that I used and what eyepiece for what magnification, things like that. On the evening of June 6, 1994, I was tracking down more Herschel objects through the area of Virgo and Coma Berenices that is sometimes called “Heartbreak Ridge”. Anyone who has trudged their way through the thicket of distant galaxies in this area will attest to the aptness of this term. But as I worked my way through this area I searched for and eventually found a spiral galaxy with the designation NGC-4526. I had located the object using the “star-hop” method by referencing my Tirion Sky Atlas 2000. The charts showed two small dots representing dim stars on either side of this object and these stars had helped to assure me that I’d actually found the specific galaxy I wanted to see. Click "read more" for the rest of this story. LOS ANGELES - New images taken of an object five times the mass of Jupiter confirm that it is a giant planet closely orbiting a distant star, an international team of astronomers reported. The team of European and American astronomers said this is the first time a planet outside of our solar system has been directly observed — a claim other scientists have also made. The team first spotted the object last year as a faint reddish speck of light circling a dim brown dwarf — or failed star — 225 light-years away from Earth near the constellation Hydra. At the time, scientists guessed the faint light was a planet, but said further observation was needed. The discovery touched off a debate over whether the object was actually a planet or a background star. Since the mid-1990s, scientists have discovered more than 130 of these so-called extrasolar planets by indirect means, but observing them directly has proved difficult. A NASA telescope peering far beyond our solar system has for the first time directly measured light from two Jupiter-sized gas planets closely orbiting distant stars, adding crucial features to astronomy's portrait of faraway worlds. Studies of the infrared light from the two giant planets suggest they are made of hot, swirling gases that reach 1,340 degrees Fahrenheit or higher. "It's an awesome experience to realize we are seeing the glow of distant worlds," said astronomer David Charbonneau of the Harvard-Smithsonian Center for Astrophysics in Cambridge, Mass., whose team captured light from a planet in the constellation Lyra. "The one thing they can't hide is their heat." UPDATE: A false alarm this time, but still a possibility at any time! Read Charley McLane's comment for the official SETI@home response. An announcement through the SETI (Search for ExtraTerrestrial Intelligence) program sponsored by the Planetary Society has found what may turn out to be the first signal from another world. A signal from the area between Aries and Pisces and centered at the radio frequency matching that of the Universe’s most abundant element, hydrogen, was reported in New Scientist magazine Thursday, September 2. The report states that the signal was found in the exact same location on three separate occasions when the giant 1000 foot diameter radio telescope at Arecibo in Puerto Rico scanned that portion of the sky. For the signal to have been found on more than one occasion and at that particular frequency is highly unusual. More searches in that area will conducted and if the same results are found on the fourth, fifth, or even sixth time, the scientific will be clamoring for a public announcement that a possible alien signal has been found. Scientists are excited about the possibility that this could really be it, a possible signal from a far-off civilization. If it turns out to be so, how will we proceed with trying to communicate with that civilization? Any signals we send in that direction will take the same amount of time to reach them as their signal took to reach us. If it turns out to be that the signal came from a star 20 or 50 light-years away, then that would mean that our signal would take 20 to 50 years to reach them, then another equal amount of time for us to expect a response back. Millions of people around the world are running a screensaver on their computers which analyze signals received by Aricebo. Anyone can download a copy of this same program known as “SETI@ Home”. Our links section contains an address if our readers would care to join in the search. STAY TUNED! This could be the start of the most exciting thing in human history. Better yet, download SETI@ Home and join in the excitement yourself. So, how many deep sky objects have you seen since becoming an amateur astronomer? There's an easy way to know how many by beginning a quest for one of several observing certificates. The nationwide Astronomical League offers three seperate certificates for deep sky observing, beginning with the Messier Certificate. Most amateurs who wish to begin work on an observing certificate start with the 110 object Messier List. Charles Messier was a French aristocrat who enjoyed looking for new comets in the mid to late 18th century. At the time, the King of France was offering a reward for the discovery of each new comet by a Frenchman of approximately $200. Although Messier hardly needed the money, he valued more the practice of having a comet named for its discoverer. Messier would diligently scan the skies with his telescope (believed to be a 6" reflector) looking for "faint fuzzies". Comets typically appear as a faint, fuzzy object that is seen to move through the background stars from night to night. Given that Messier's instrument was greatly inferior to today's typical telescope optics, he regularly came across comet-like objects that never moved. Messier began to record these non-moving objects so that he and others would not waste time suspecting a comet from an object that was listed in what will forever be known as Messier's List. These objects that form Messier's List are some of the finest deep sky objects available to amateur instruments. 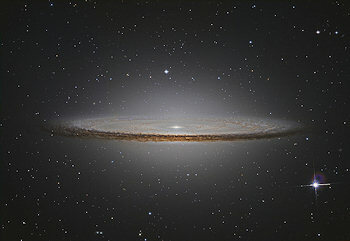 They run the gamut of object types from galaxies to star clusters to all types of nebulae. Virtually every chart of the heavens lists these objects with a designation number preceeded by an M, the well known M-objects.